Embattled former Ghana Football Association (GFA) president, Kwesi Nyantakyi has finally broken his silence on the Number 12 expose by Tiger Eye PI lead by Anas Aremeyaw Anas. The lawyer says Anas would not have survived his schemes if he were living in other jurisdictions. He told Accra based Oman Fm he has filled a case in Dubai where he was illegally recorded by the Tiger Eye PI team. He said, Anas would have to respond to the issues and explain why he illegally recorded him. He also insisted Anas demanded an amount of $150, 000 to drop the case and that was the genesis of the saga that has brought him embarrassment. Kwasi Nyantakyi noted that he never met Anas in the course of his work but met the late Hussein-Suale on several occasions. He described Tiger Eye PI as a criminal company that is engaging in illegal activities. He is also alleging some opposition at the GFA paid Anas and his team sponsored the Number 12 project with an amount of $400,000. Mr Nyantakyi said he knew he was being recorded but he did not know it was for an ill motive. 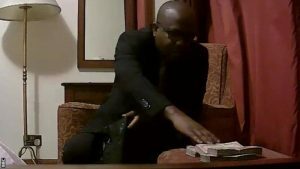 Football’s world governing body launched an investigation after Nyantakyi was pictured taking $65,000 (£48,000) from an undercover reporter.